As a positive psychology researcher and bestselling author, I am committed to helping you leverage the science of happiness to create more happiness and success in your life. Through my research, I am dedicated to empowering people like YOU to create the positive change you wish to see in this world. 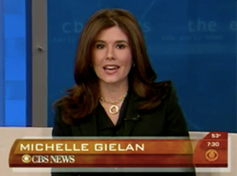 I had a dream job at CBS News—and quit. As an anchor of two national news programs, I was disturbed by the amount of negativity in the news. I didn’t want a child walking through the room while I was doing my job, hearing me continually telling negative stories about the world. In a study with Arianna Huffington, we found that 3 minutes of negative news in the morning can lead to a 27% higher likelihood of you having a bad day, as reported 6-8 hours later. But my time at CBS News also showed me the incredible power we have to create positive change by broadcasting a worldview that is more empowered, optimistic, and solution-focused. I left my job as a broadcaster at CBS News to study positive psychology—the science of happiness and human potential—under Dr. Martin Seligman at the University of Pennsylvania. As parents, teachers, friends, colleagues, we are all constantly broadcasting information to the people around us. IN EACH MOMENT WE HAVE A CHOICE OF WHAT WE TALK ABOUT. Complaints, hassles, problems and symptoms OR the meaning embedded in the work we do, the things we are grateful for, and the solutions we can take in the face of a problem. By making small changes to your personal broadcast, you can positively influence everyone around you—making you happier and more successful at the same time. My research shows your optimistic, empowered mindset is the most valuable resource in creating happiness and forward progress. A positive brain fuels performance, specifically by decreasing stress by 23%, improving creative problem solving by 20%, and increasing productive energy by 31%. When you broadcast an empowered mindset to others, you help move their brain from problem to solution. You remind them that positive change is possible. 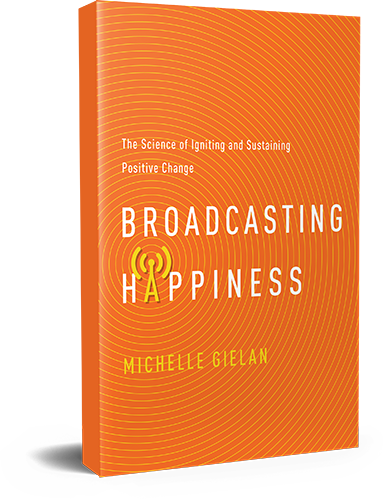 I share research and dozens of inspiring stories in my best-selling book Broadcasting Happiness—and most importantly, how you can apply the science to achieve similar results in your own life. THIS IS NOT JUST A CALLING. In my mid-20s, depression took over. My external life was “perfect.” Prestigious job in London. Jet setting around Europe. Loving boyfriend. Yet I was lost and mentally exhausted. I’ll never forget sitting with shoulders hunched, looking out the window of my apartment, feeling empty and worried that this was the end of the story. One day I started applying the same positive psychology strategies I now research. Not only did I emerge from depression stronger than before, but now I have both an amazing external and internal life. As a working mother, I am busy managing our business and the house—AND able to be present with my young son and daughter to experience joyful moments every day. Happiness often doesn’t just happen. It takes attention…and that is where the research we’re doing gets exciting. Today, I run the Institute for Applied Positive Research, investigating how mindset fuels happiness and success at organizations including Google, Boston Children’s Hospital, The Leukemia & Lymphoma Society, and Pepsi Co.—and the results have been remarkable. More recently, my husband and fellow researcher Shawn Achor and I have been bringing the science of happiness to schools where we’re seeing dramatic improvements in grades, graduation rates and student well-being. For us, there is no more rewarding work than that. I am dedicated to empowering YOU with our research to help you create the positive change you wish to see in this world. We know it is possible to retrain the brain to be happier and less stressed at any age. We know that positive psychology gives us a scientifically validated roadmap to happiness. I believe you are reading this because you are already an agent of change—and are searching for a way forward. As I said before, we have important work to do together. The world needs you broadcasting happiness. Read Michelle’s research in Harvard Business Review on how to prime the brain for peak performance. Learn how Michelle can work with your organization to fuel higher engagement, performance and profitability. 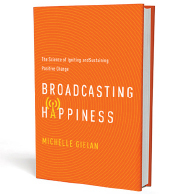 People like you are changing their families and work teams using research in Broadcasting Happiness. Get a dose of inspiration now.